Idea Lab starts the new season with seven new projects, in which all enterprising students have an opportunity to develop their business ideas, listen to leaders of internationally renowned startup companies or lead their team to the finals of the business ideas contest Kaleidoskoop. It is possible to gather ideas in Tartu, Pärnu, Narva, as well as Riga. As a new project, a series of business idea development workshops for advanced teams – the STARTER Advanced programme – is opened this semester. According to head of Idea Lab Maret Ahonen it is pleasant that this year it is possible to offer a training programme for teams who are already operating, and in this way, support their way to their first paying customer. The programme starts on 21 September in the Paabel building, where all interested students can present their business ideas to join the programme. Workshops are conducted by practicians with international experience. During this semester, Idea Lab’s activities will also expand outside Tartu and Estonia. On 20 September, the STARTER Basic programme starts again in Pärnu, for participants from the university, vocational school and gymnasiums. A completely new project, the STARTER Basic programme in Virumaa, is launched in cooperation with Tallinn University of Technology. An inspiration event “100 Ideas that Change the World” is held in UT Narva College already this Friday, 15 September. 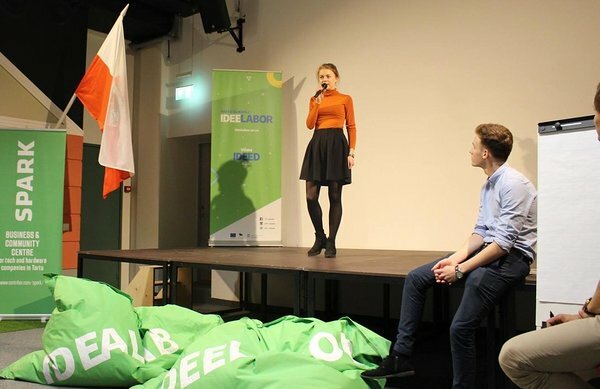 The best team in each programme will get an attractive award – an opportunity to present their idea at the finals of the Kaleidoskoop contest at sTARTUp Day. This year’s sTARTUp Day takes place in AHHAA Science Centre on 8 December. The Idea Lab also heads abroad. “Idea Lab’s experiences in developing student teams and conducting the STARTER programme of developing business ideas have brought us cooperation offers from international partners. For example, we participate in the Estonian and Latvian pre-acceleration programme EstLat-Accelerate, which starts with the Garage48 hackaton “Hardware&Arts” from 29 September to 1 October in Riga. It is important to point out that differently from STARTER, in this programme the participants do not have to be students. In addition, we share our experience of the STARTER programme in Ukraine, where, in cooperation with different Kiev universities, the STARTER@Ukraine programme is launched at the beginning of 2018,” said acting head of the Centre for Entrepreneurship and Innovation Piret Arusaar. More information about all the programmes is available on the Idea Lab website ideelabor.ut.ee.